Planting Supplies & Fertilizers Plants are an essential component in all ponds. Not only creating beauty, but also helping to maintain an overall balanced ecosystem. 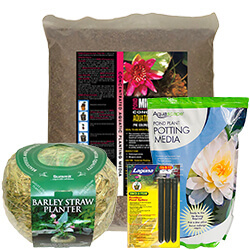 We offer a complete line of products you'll need to grow and maintain healthy aquatic plants. A complete line of containers to support your aquatic plants. We offer fabric pots, rigid plastic tubs and mesh plastic baskets to name a few. Making it simple to relocate and house all aquatic plants. All aquatic plants should be fed. Give your plants the nutrients they need to ensure proper growth and longer lasting blooms. Available in tablet and granular form, spikes and liquids.